The weathered bone pictured above sits on my desk as a treasured memento. 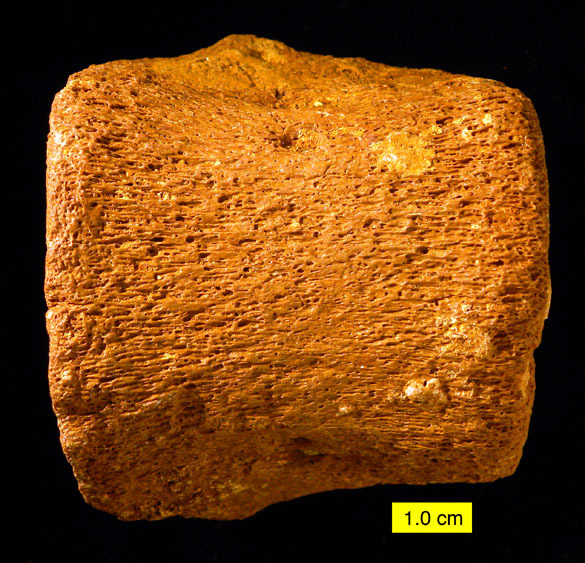 It is the centrum of a plesiosaur vertebra. I found it in the Faringdon Sponge Gravels (Lower Cretaceous) of Oxfordshire, England, during my first research leave (1985). I was working on a project involving encrusters, borers and nestlers (now called sclerobionts) on and in cobbles in this marine gravel (Wilson, 1986). This bone rolled out of the gravels at my feet during a particularly rainy field day. But why do I say in the title that this vertebral fragment is Jurassic if it is found in a Cretaceous deposit? Because it is what paleontologists call a remanié fossil, a fossil reworked from an earlier deposit into a later one. During the Early Cretaceous, tidal currents worked on an exposure of Jurassic claystones in what will become southern England, eroding bones and other Jurassic debris and transporting them into a gravel-filled channel. This gravel consisted of bones, shells, quartzite pebbles and claystone cobbles. It was tossed around under marine conditions, with many of their surfaces encrusted and bored by invertebrates. If you look closely at the end-on view above, you can see some lighter-colored patches that represent little calcareous sponges. When I collected this bone these sponges were the important parts. Now I’m impressed more by the fact that it is a bit of plesiosaur. Plesiosaurs (the name means “near-lizard”) were magnificent marine reptiles of the Jurassic and Cretaceous. They were extraordinary predators on a variety of animals, and despite their bulk were highly maneuverable because of their four large paddle-like appendages. 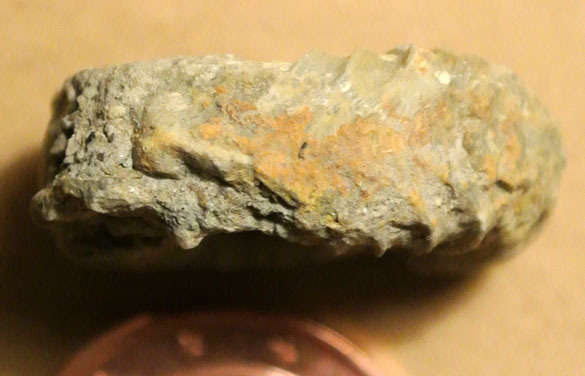 My little bone is too weathered to place in the complex plesiosaur skeleton, other than to say it is probably from the back rather than the neck or tail. Rather than me wax poetic on the Plesiosauria, you might want to visit Plesiosaur.com. The first plesiosaur (Plesiosaurus dolichodeirus) was found by one of the most famous paleontologists of the 19th Century: Mary Anning (1799-1847). Anning was a spectacularly successful fossil collector along the “Jurassic Coast” of southern England. She had a tough life, selling fossils to support her family. 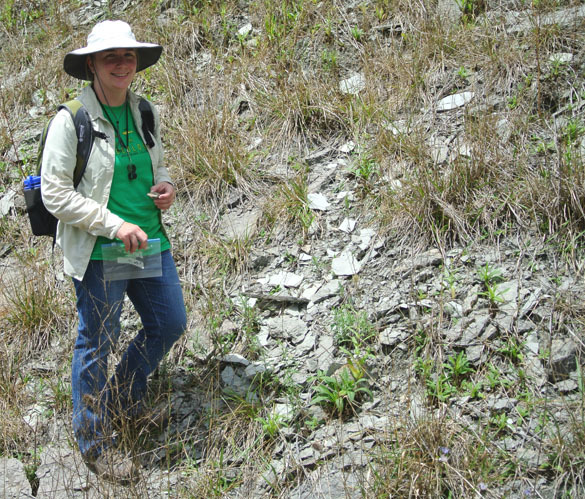 She discovered many Jurassic fossils, from ammonites to ichthyosaurs and plesiosaurs. The paleontological establishment at the time often bought fossils from her, but they didn’t always give her credit for her work. Little known fact: Mary Anning was the inspiration for the classic tongue-twister, “She sells seashells on the seashore. The shells she sells are seashells, I’m sure. So if she sells seashells on the seashore, then I’m sure she sells seashore shells.” I’m sure she’s proud! To Mary Anning and her magnificent plesiosaur! Conybeare, W.D. 1824. On the discovery of an almost perfect skeleton of the Plesiosaurus. Transactions of the Geological Society of London, Second series; 1 p. 381-389. Goodhue, T.W. 2002. 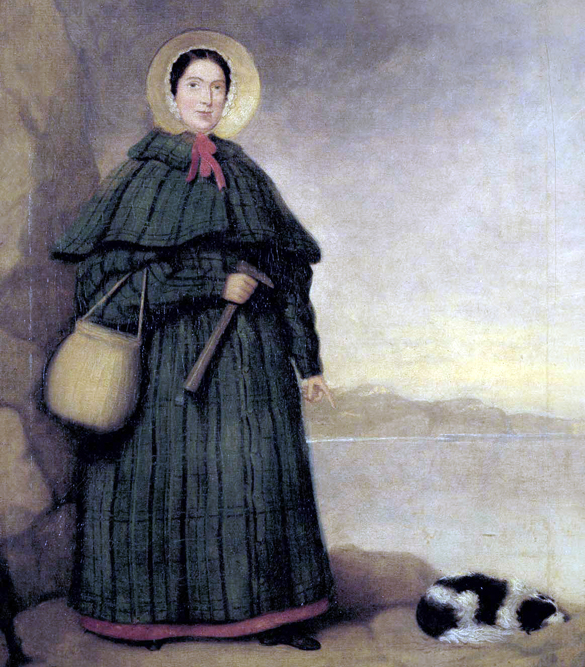 Curious Bones: Mary Anning and the Birth of Paleontology (Great Scientists). Morgan Reynolds. Wilson, M.A. 1986. Coelobites and spatial refuges in a Lower Cretaceous cobble-dwelling hardground fauna. Palaeontology 29: 691-703. 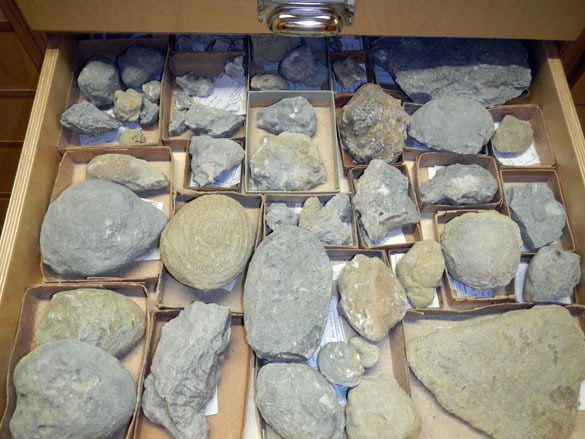 WOOSTER, OHIO–I’ve seen a lot of fossils in my blessedly long time as a paleontologist, and I’ve had the opportunity to study them in many exotic places. I’m often reminded, though, that one of the best preserved and most diverse fossil faunas is in my backyard: the Cincinnati Region. The fossils here from the Upper Ordovician are extraordinary, and they will always be a resource for paleontological research. They’re just plain fun to find, too. There is a reason why so many American paleontologists have educational roots in the Ohio, Kentucky and Indiana area. We are here today to collect material for Kit Price’s Junior (and then Senior) Independent Study project. She will be studying bioimmuration processes in these rocks. We will have more on her study after we unpack and clean the treasures we collected today. 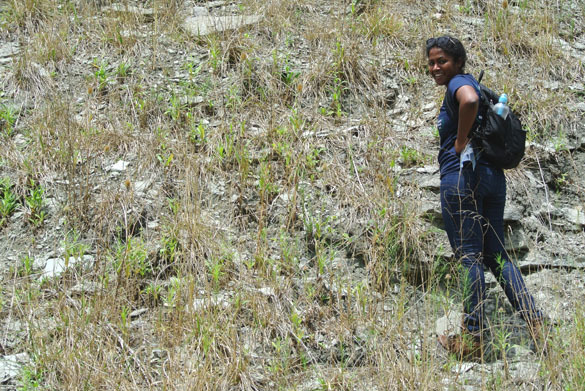 Richa Ekka (above) generously volunteered to help us find and collect fossils. You may remember Richa from her very recent work in Estonia. (It is difficult to believe that just two weeks ago we were on islands in the Baltic.) 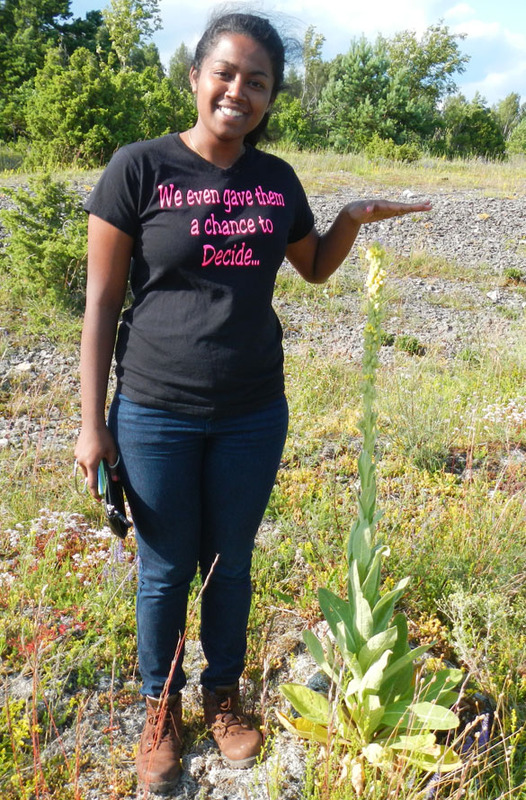 Richa, as always, found great specimens. 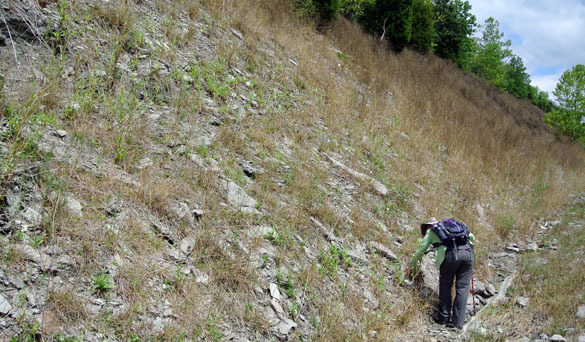 Here is Kit working on our last Cincinnatian outcrop near Brookville, Indiana (C/W-111). Note the very dry grass, a result of the continuing drought in this part of the state. The temperatures today, by the way, were in the pleasant high 60s and low 70s. 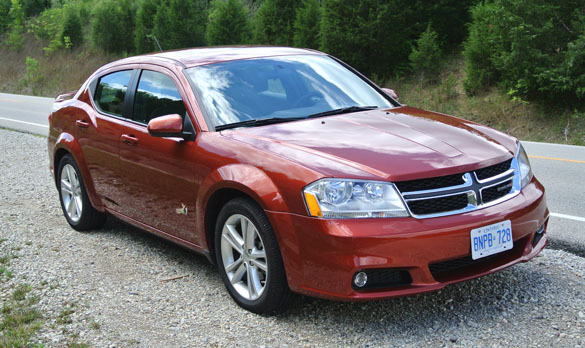 Finally, we just had to share a photograph of our rented field vehicle: a Dodge Avenger. We think this is the trendiest car color of 2012: burnt pumpkin. More in later posts on what we found on this field trip, and Kit’s developing Independent Study project. 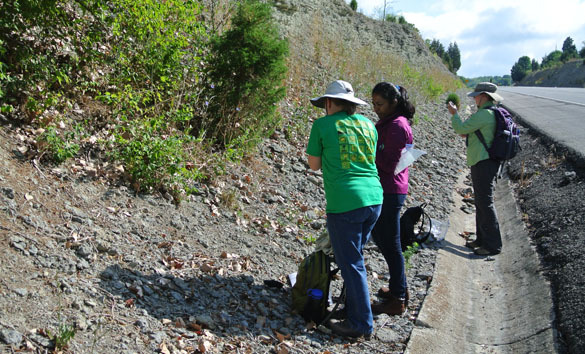 It was a spectacular field day with excellent fossils and great conversations. There are two common fossil types that begin with “strom” and look roughly alike to the untrained eye. One is the stromatoporoid, which is a calcareous sponge, and the other is the stromatolite, which is a layered structure produced by photosynthetic bacteria. I hadn’t seen them together until our expedition to the Silurian of Estonia last summer. Wooster senior Nick Fedorchuk (’12) collected the specimen above at his outcrop of limestones and dolomites just above the Wenlock/Ludlow Boundary along Soeginina Cliff, Saaremaa. (In the rock sequence Richa Ekka is now studying.) We thought it was simply a stromatolite until he cut it to show that the base was a stromatoporoid. “Stroma” is Greek for a bed or layer. Both stromatolites and stromatoporoids have horizontally laminated structures. The “lite” in stromatolite means rock, so a stromatolite is literally a “layered rock”. They are accretionary structures made by mostly cyanobacteria that collect and bind fine sediment into thin layers, usually in very shallow waters. Often the bacteria make their own calcareous cement for these laminae as a byproduct of photosynthesis. 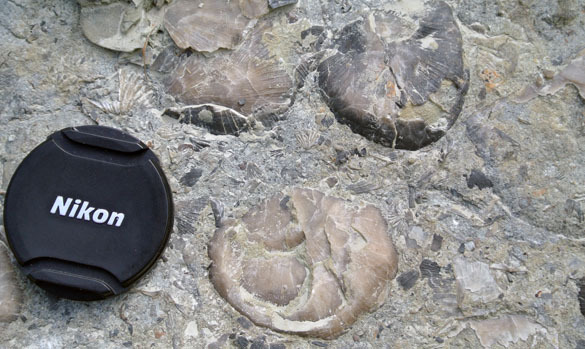 They’ve been doing this for a long time: the earliest known fossils are 3.5 billion-year-old stromatolites. 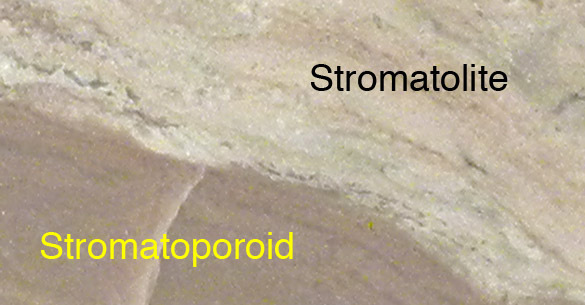 Stromatoporoids are very different. The “poroid” refers to their semi-porous skeletal layers, which are separated from each other by minuscule pillars. Their peak of abundance was in the Silurian and Devonian Periods, but they survived all the way up into the Cretaceous. 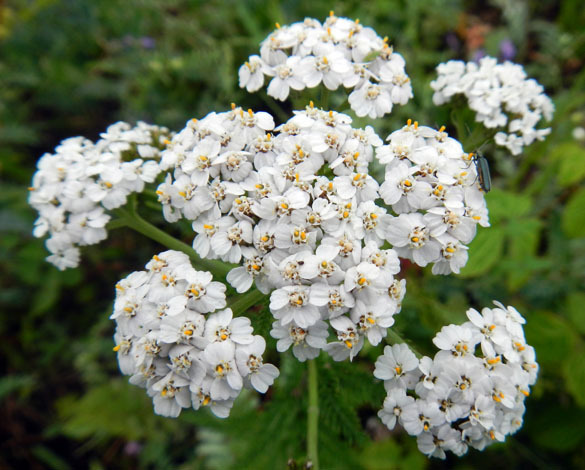 They made significant reefs in the Paleozoic, often more common than the corals back then. We believe that they were a type of sponge (Phylum Porifera) with a thin layer of soft tissue on the exterior layer filter-feeding in the typical sponge manner. 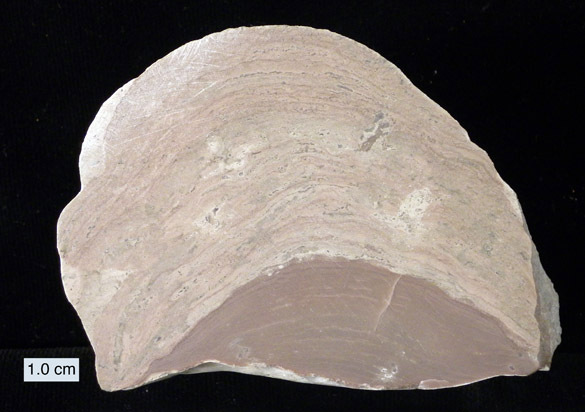 Stromatolites are more common in sediments formed in very shallow, warm marine waters with elevated salinity; stromatoporoids liked more normal marine conditions. Finding the stromatolite on top of the stromatoporoid here means that either the environment changed between the two (shallowing, likely), or that the stromatoporoid was dislodged from more offshore waters during a storm and washed into a shallow lagoon, becoming a substrate for stromatolitic growth. Curiously, there was a suggestion in 1990 by Kaźmierczak and Kempe that stromatoporoids ARE stromatolites. They pointed out that precipitation features in modern stromatolites can be very complex, producing features that resemble those of ancient stromatoporoids. This idea gained no traction, though, and most paleontologists are satisfied that these two types of “strom” have very different origins. Akihiro, K. 1989. Deposition and palaeoecology of an Upper Silurian stromatoporoid reef on southernmost Gotland, Sweden. Geological Journal 24: 295-315. 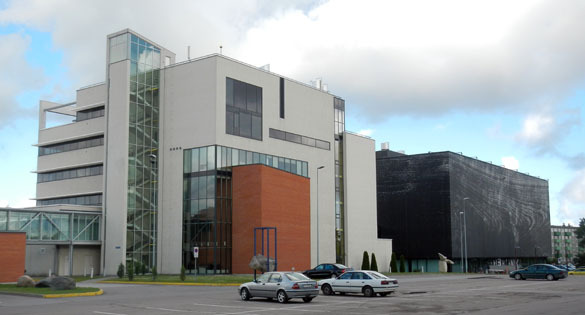 Kaźmierczak, J. and Kempe, S. 1990. 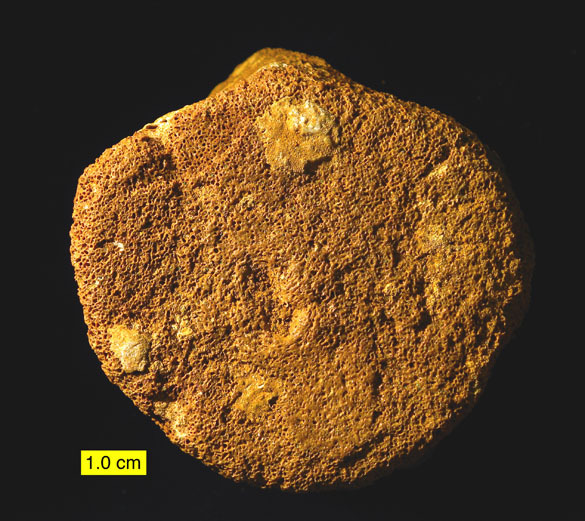 Modern cyanobacterial analogs of Paleozoic stromatoporoids. Science 250, no. 4985, pp. 1244-1248. Lebold, J.G. 2000. Quantitative analysis of epizoans on Silurian stromatoporoids within the Brassfield Formation. Journal of Paleontology 74: 394-403. Segars, M.T. 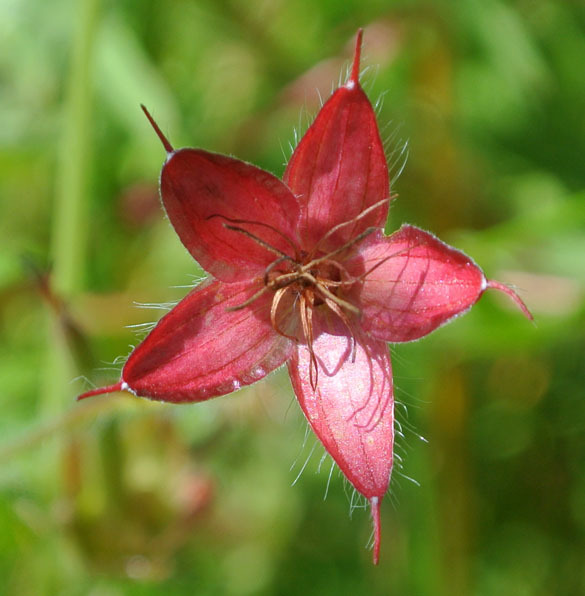 and Liddell, W.D. 1988. Microhabitat analyses of Silurian stromatoporoids as substrata for epibionts. Palaios 3: 391-403. Soja, C.M., White, B., Antoshkina, A., Joyce, S., Mayhew, L., Flynn, B. and Gleason, A. 2000. Development and decline of a Silurian stromatolite reef complex, Glacier Bay National Park, Alaska. Palaios 15: 273-292. Vinn, O. and Wilson, M.A. 2010. Endosymbiotic Cornulites in the Sheinwoodian (Early Silurian) stromatoporoids of Saaremaa, Estonia. Neues Jahrbuch für Geologie und Paläontologie, Abh., v. 257: p. 13–22. The Hilliste Formation on the island of Hiiumaa, western Estonia, is a Rhuddanian (Llandovery, Lower Silurian) sequence of limestones and shales. 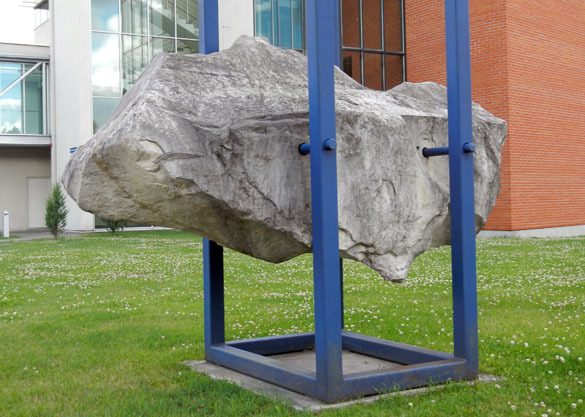 It represents some of the earliest Silurian rocks on the paleocontinent of Baltica. The depositional system was tropical and shallow marine with tempestites indicated by overturned and broken corals and stromatoporoids. This unit contains a recovery fauna from the Ordovician Mass Extinction. Major taxa in the Hilliste Formation include crinoids, trilobites, bryozoans, corals, stromatoporoids, gastropods, and brachiopods. Sclerobiont communities (organisms that lived on or within hard substrates) have not yet been described from Rhuddanian faunas. The Hilliste Formation contains many encrusters and a few borings on skeletal substrates (primarily corals and crinoid stems). These sclerobionts include at least three kinds of crinoid holdfasts, cornulitids, sheet-like bryozoans, runner-type bryozoans, erect bryozoan holdfasts, and auloporid corals. Most if not all of these sclerobionts inhabited dead substrates. 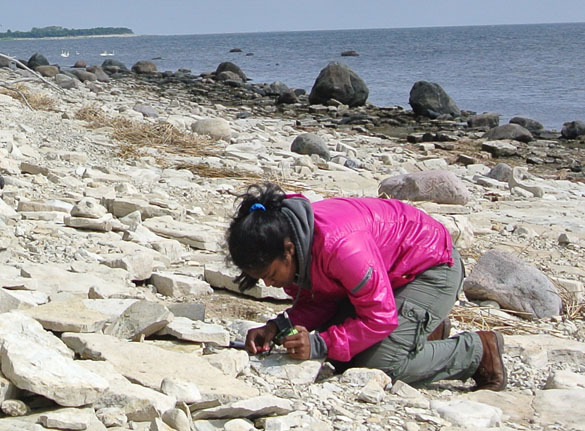 We studied the Hilliste Formation in a small quarry near the village of Hilliste on Hiiumaa. Numerous encrusted and bored specimens were collected for analysis of sclerobiont occurrences in this rare example of a Rhuddanian hard substrate community. These encrusters and borings, along with the macrofauna, have a distinct Late Ordovician aspect. The Soeginina Beds in the Paadla Formation on the island of Saaremaa, western Estonia, are a Lower Ludlow (Upper Silurian) sequence of dolostones, marls, and stromatolites. They represent rocks just above the Wenlock/Ludlow boundary, which is distinguished by a major disconformity that can be correlated to a regional regression on the paleocontinent of Baltica. We interpret the depositional environment of the Soeginina Beds as having been a hypersaline lagoon. Our evidence includes halite crystal molds, oscillation ripples, eurypterid fragments, stromatolites, ostracods, gastropods, Chondrites trace fossils, intraclasts and oncoids. Nautiloid conchs are common, probably because storm currents washed them in. We measured two sections of the Soeginina Beds at Kübassaare, eastern Saaremaa, western Estonia. The beds in one section are virtually horizontal; in the second they are steeply dipping, probably because of Pleistocene glacial ice overpressure. The beds begin with fine-grained dolostone and end with large, well-preserved domical stromatolites. The equivalent section at Soeginina Pank in western Saaremaa (about 86 kilometers away) has larger oncoids, branching coral fragments, and smaller stromatolites. It is also more heavily dolomitized. We interpret these differences as showing the western Soeginina Beds were deposited in slightly deeper, less saline waters than those in the east at Kübassaare. 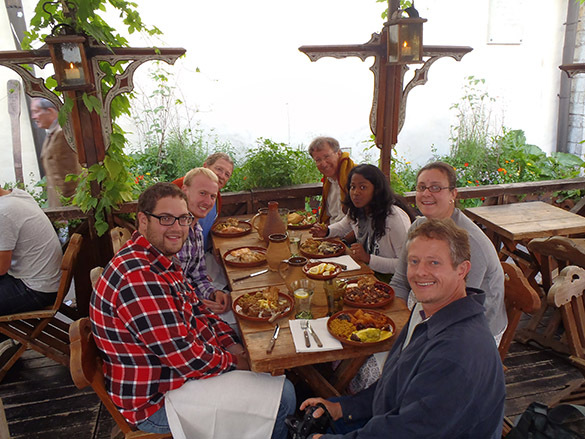 TALLINN, ESTONIA–We had our final group dinner in the Olde Hansa restaurant. (Freezing at an outside table, I might add, but the food and company was excellent.) We leave for the USA at 5:00 a.m. tomorrow morning. 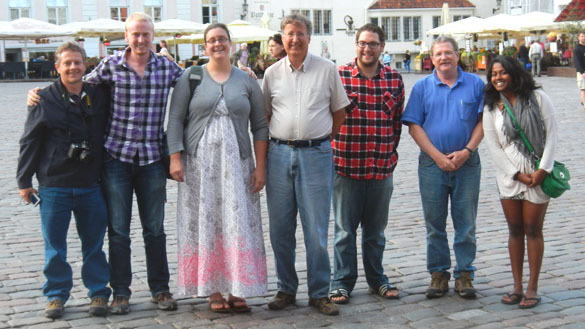 Pictured above, just after our hearty dinner, are, from the left, Mark Peter, Jeff Thompson, Alyssa Bancroft, Mark Wilson, Jonah Novek, Bill Ausich, and Richa Ekka. It is a delightful team. We are already looking forward to our Ohio reunion. Bill’s image of our last dinner in Tallinn. So much fun, especially after such a successful field trip. Note that it was a bit chilly! 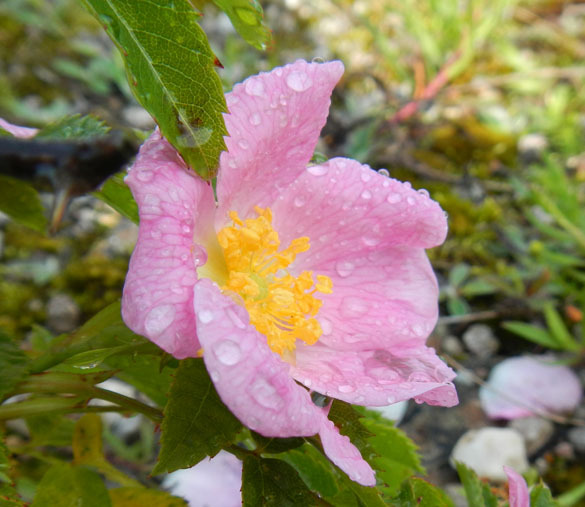 This wild rose has raindrops from the first downpour we experienced at Undva Pank. 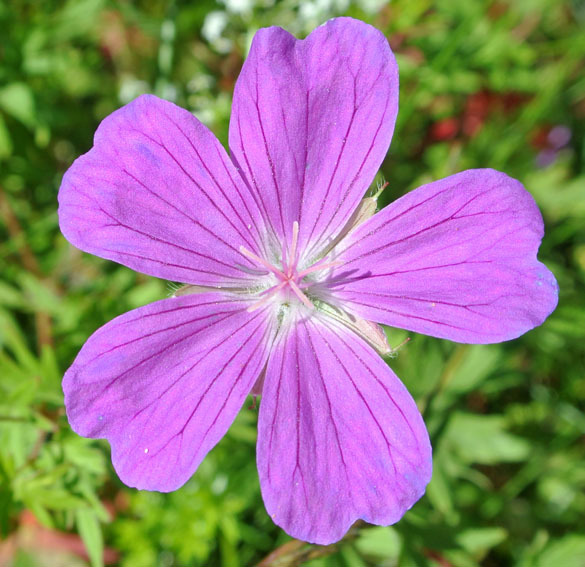 This geranium-like flower is one of the most common on Saaremaa. This is the first time I’ve seen these little red stars. 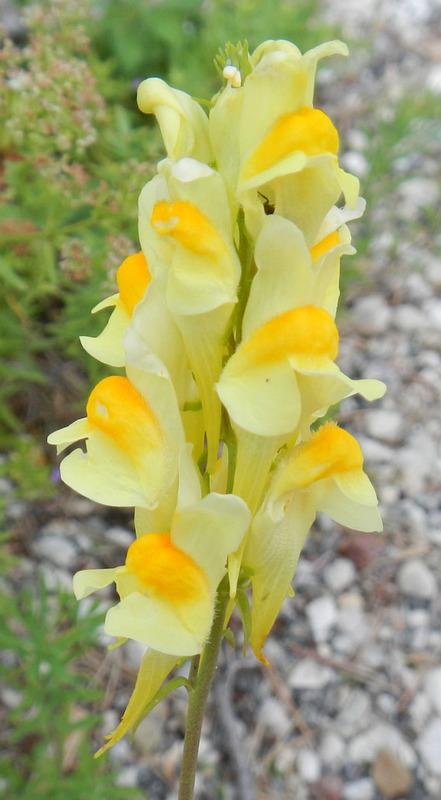 These long yellow shoots were found only on the alvars on the Sarve Peninsula on Hiiumaa. These look a bit like Mountain Laurel at home. 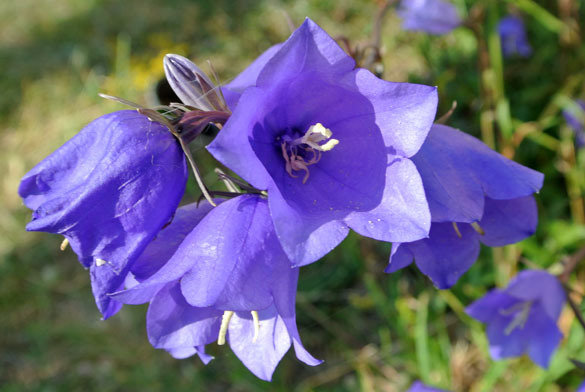 I have no idea what these lily-like flowers are. They are striking in the field. It must be an interesting place if they bolt a rock up off the ground in front! Bill is here looking at crinoids Ursula set aside for us to examine. Note his use of an iPad for taking notes and images, just like Wooster geologists did last year at Ohio State. 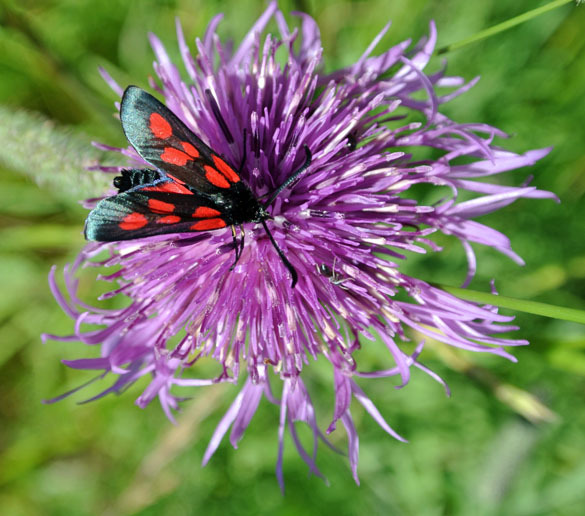 Bill carries his entire pdf library with him on his iPad, and makes many annotated images of museum specimens. Typical hall of cabinets in the Institute of Geology. 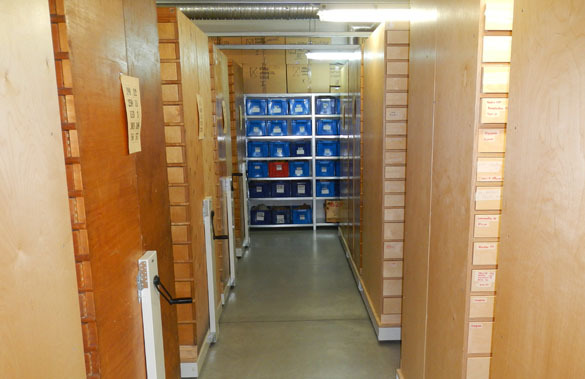 Each set of drawers is on a mechanical device for closing the aisles to increase storage space. 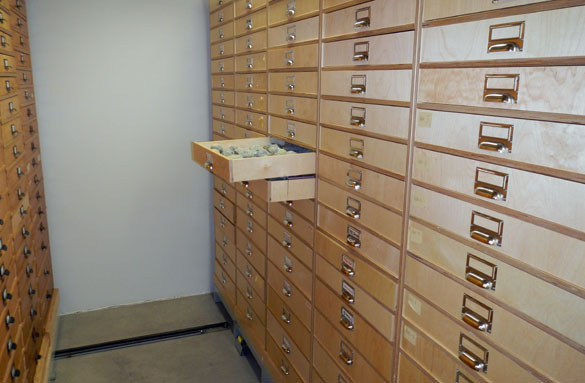 A typical drawer of specimens. 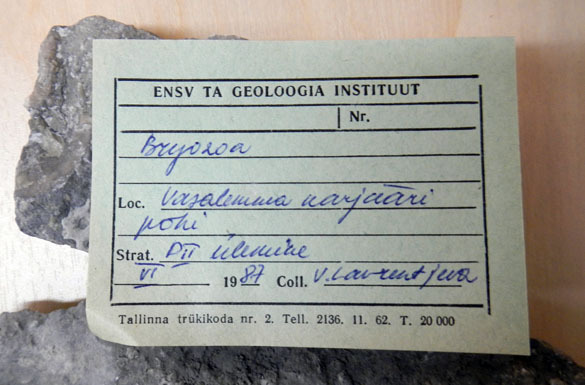 These are newly collected from the Reinu Quarry by our friend and colleague Olev Vinn. A specimen label. Unfortunately some are nearly indecipherable. Sometimes it is because a Russian worker was transliterating information into Latin letters. There is often an interesting mix between the Russian, Estonian and English languages. Fortunately Ursula and others can quickly translate for us! 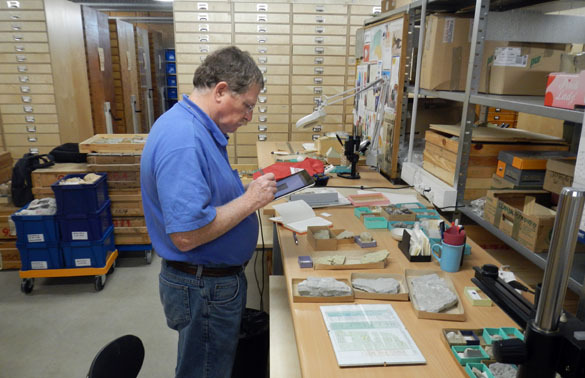 We enjoyed working in the Institute of Geology collections very much. They are not only superbly organized, much of their content is listed (and even imaged) online. We saw many critical specimens, and Bill was able to borrow some important crinoids. Thank you to Ursula for her kindness and excellent assistance! TALLINN, ESTONIA–Early this morning the Wooster/OSU geologists left the Estonian island of Hiiumaa on the ferry from the port of Heltermaa (58° 52′ N, 23° 3′ E; seen above). After a 90-minute ferry ride, we landed on the Estonian mainland. We looked briefly at some quarries near Pusku south of Haapsalu (the limestones were too dolomitized for our liking) and then made the two-hour drive to Tallinn. After negotiating the most miserable intersection in Europe (which is under perpetual construction), we at last gassed up our cars and turned them in to the Sixt rental agency. There is nothing quite like the feeling of returning vehicles safely after such a long trip — it is only topped by returning students safely to their homes, of course! We are now in Tallinn for two nights. 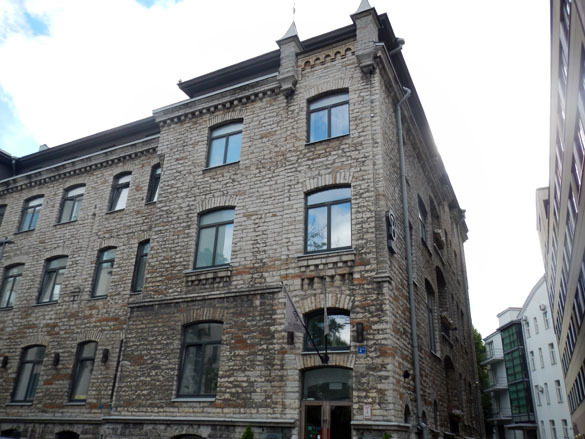 Bill and I have an appointment with the chief curator at the Institute of Geology in Tallinn as our students take a day off in the city. We are all staying at the St. Barbara Hotel near Old Town — a place beloved by many past Wooster students (depending on whether we have drunk Russians serenading us from the street all night.) I like that the building stone is a beautiful local Ordovician limestone. KÄINA, ESTONIA–It has been a rainy day on the Estonian island of Hiiumaa. The Wooster geologists stayed inside most of the day to work on their Geological Society of America abstracts. 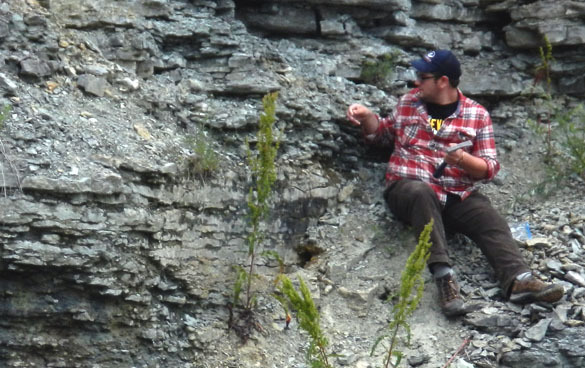 Bill Ausich and his Ohio State University team, though, returned to the Hilliste Quarry and continued to collect fossils. To our great surprise, they picked up two more specimens of that strange planispirally-coiled shell that Richa found on July 13. One is shown above, and the “venter” view is shown below. All specimens were found in a yellowish unit that matches the matrix in the fossils (although we’ll check in the lab to make certain). These new finds reduce the chances that the fossils are a product of “site contamination” in which a visitor discards specimens from a previous trip, often to make room for new ones. That is still a possibility, but an increasingly remote one. So what are these? They look very much like Mesozoic ammonites, all the way down to deflections of ribs along the periphery as you might be able to see above. (Specimen photography in a hotel room has its challenges.) 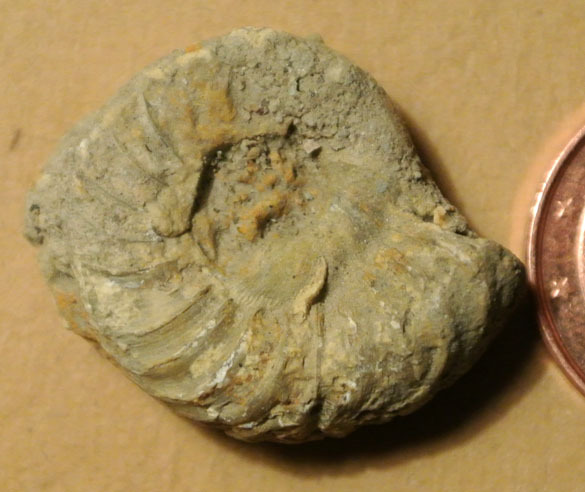 The earliest ammonoids, the larger group that contains ammonites, appear in the Devonian (the period after the Silurian), so it is unlikely we are looking at that group. They are certainly mollusks, though, so most likely gastropods (snails) or nautiloids. Coincidentally enough, Wooster alumnus James St. John has a webpage with a photograph of a coiled, ribbed nautiloid known as Graftonoceras, which you will note has many similarities with our mystery critter. The specimen he photographed is in the museum at, of all places, Ohio State!